It's the kind of "fishing" all campers will love. 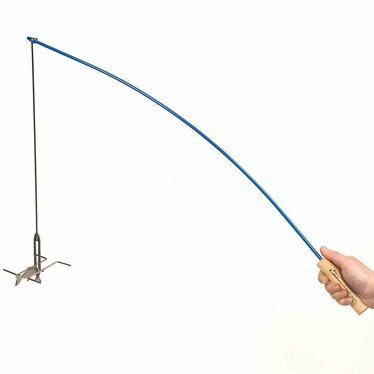 Feels like a fishing pole and even looks like one, steel rod holds hot dogs and marshmallows for fun, safe cooking. Food rotates with a jig of your wrist. Note: Pole comes in assorted colors (we're sorry but we cannot guarantee what color you'll receive). I purchases this item for my nieces who love to camp and fish. I have to say that I have had as much fun with it as they have. The pole is sturdy and cleans easily. 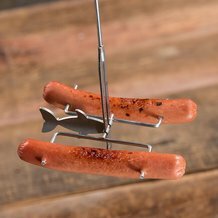 The steel rods hold hot dogs, sausages, brauts or marshmallows securely for cooking over an open fire. Rotating the food with a flick of the wrist is easy (once mastered) and causes giggles and smiles on the faces of those seeing it for the first time. I would offer a word of caution. 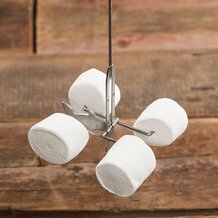 If using marshmallows with small children, be sure to tighten the tension nut to keep parents and over protective aunts from jumping across fires to put out flaming marshmallows swinging perilously close to little faces. Other than that, it has brought us hours of fun and has been a great conversation starter around the campfire. A solid 4 stars!